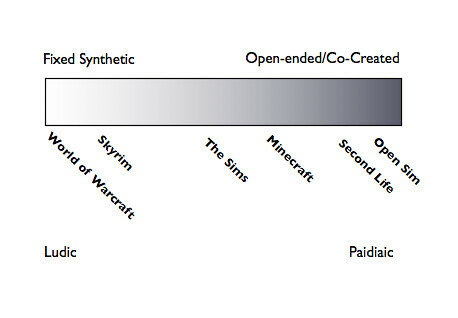 The two modes of play can be thought of on a spectrum – too much toward one end the game risks becoming a grind whilst too much in the other direction the game can often feel pointless (if a game at all), and indeed this game/not game binary distinction is often discussed when exploring the differences between games and virtual worlds. Fixed Synthetic worlds such as World of Warcraft & Skyrim are characterized as ludic environments as they are primarily defined by Blizzard & Bethesda, who have complete control over narrative, world rules, mechanics and design. On the other end of the spectrum we have co-created worlds like Minecraft that include affordances for the customization of the environment that allows players to engage in content creation within the parameters of the world’s design. These paidiaic environments typically have no set storyline and are open for interpretation by the player, allowing players to build their own spaces and express their creativity. Regardless of where the world falls on this spectrum we see evidence of emergence as play ecosystems or communities of play that transcend the original game space. The term magic circle was coined by Dutch historian Johan Huizinga (1872–1945) in his work Homo Ludens: A Study of the Play-Element in Culture, Huizinga basically states that the magic circle of a game is where the game takes place. To play a game means entering into a magic circle, or perhaps creating one as a game begins. 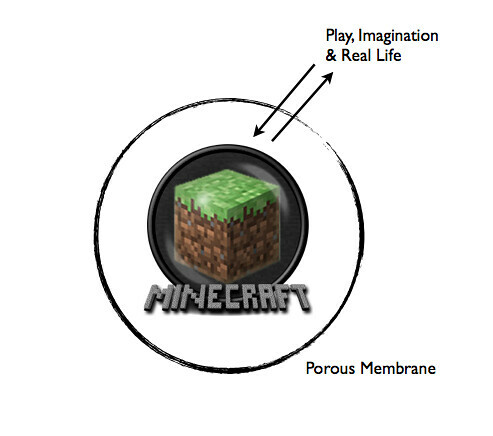 The magic circle was often thought of as a circle where belief could be suspended, sacrosanct, one which bounds play in time and space from ‘reality.’ This definition is starting to blur as evidenced by our work with students from around Victoria in Quantum Victoria @ Massively Minecraft. Quantum Victoria @ Massively Minecraft is for kids aged 4-16 in Victoria exploring digital citizenship, creativity and imagination using the video-game Minecraft. Hosted by Jokaydia as a pervasive online game environment, our current game has over 65 Achievements that children can undertake and each can be mapped to the ISTE NETs Standards for students using technology in learning. Whilst originally developed as an innovative model for outreach in the STEM disciplines, we are seeing students mature and develop skills like self-efficacy, sharing, negotiation, conflict resolution, thinking skills, empathy and most importantly leadership. Students as young as 12 years old are taking ownership of the space and exhibiting leadership well beyond their years. This feature of emergence was intended – having students teaching and mentoring each other so that the space becomes a self-sustaining learning/play community. The magic circle coined by Huizinga can be better described as a porous membrane with culture invading the game world, and the game invading culture. (eg. 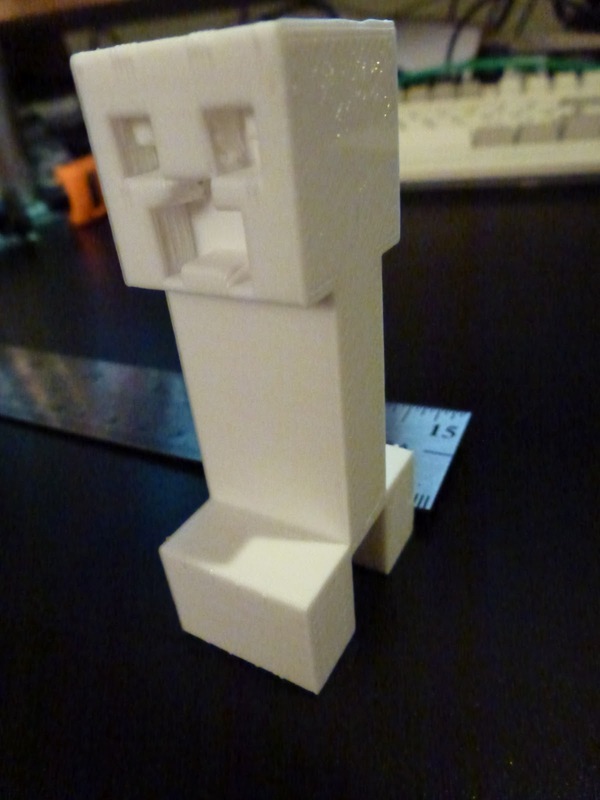 Students designing and creating Creeper’s on our 3D printer similar to this one).